Skinny Jalapeno Pimento Cheese – a spicy, healthier take on the southern favorite. 6 ingredients, no mayonnaise! For example, I never had Bojangles until I was in college. I also never owned a pair of Rainbow Sandals until then either. Those of you who did not grow up in NC may not have any clue what I’m talking about, but you should know that apparently means I lived under a rock. 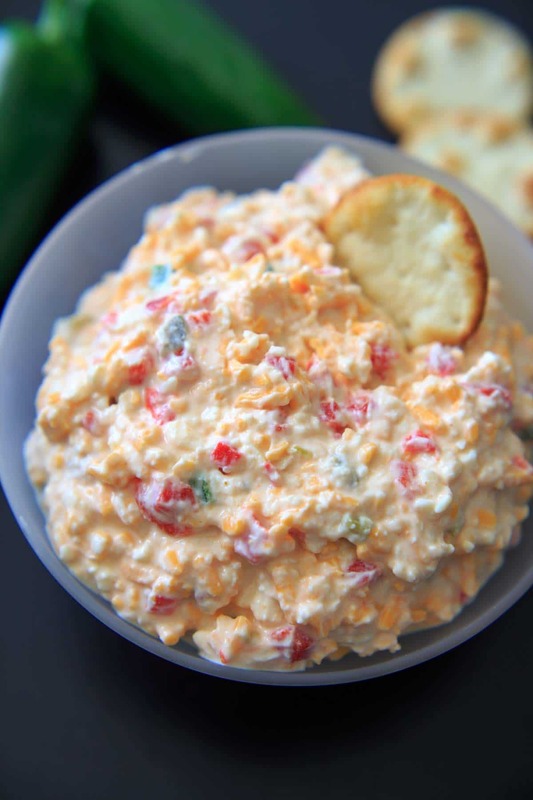 Pimento cheese is another example. The first time I remember eating it was only a couple years ago, well into my adulthood, and when I still thought pimento’s were a kind of olive. (Note: they are not an olive, they are a pepper). There’s a variety of local pimento cheese with jalapenos that I sometimes buy at my grocery store and I can’t seem to get enough of it. I decided to make a bit of a healthier version by swapping out mayonnaise for greek yogurt. I will say it’s not exactly the same (kind of like my cauliflower pizza or chickpea cookie dough) but it gets the job done. 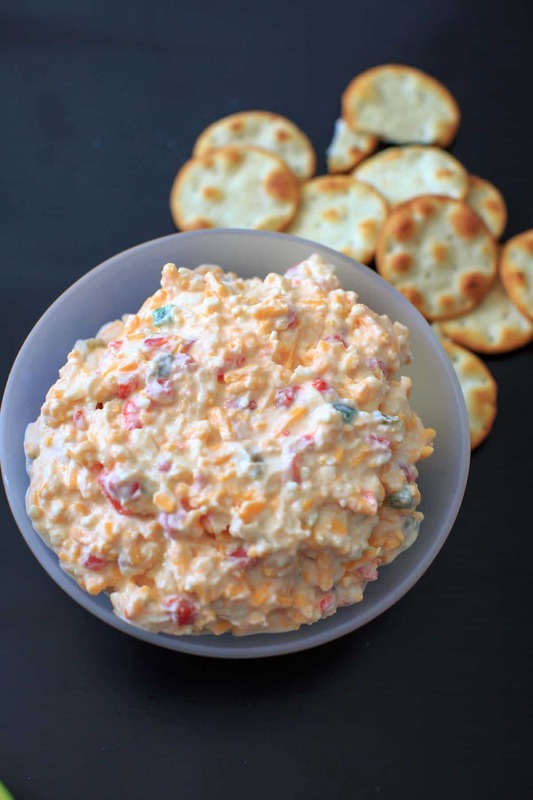 Pimento cheese is traditionally made with mayonnaise and cream cheese. Because how could something known as the “caviar of the south” NOT be made with mayonnaise and cream cheese? The result is not quite as thick without the cream cheese. But the spiciness adds a little something that can help trick you just long enough into not realizing you’re being healthier. You’re welcome. 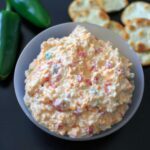 Use this spicy pimento cheese dip as a sandwich spread or an appetizer dip for parties or game-watching. Related recipes: If you like “skinny” and “spicy” dips – also check out my skinny bang bang sauce! 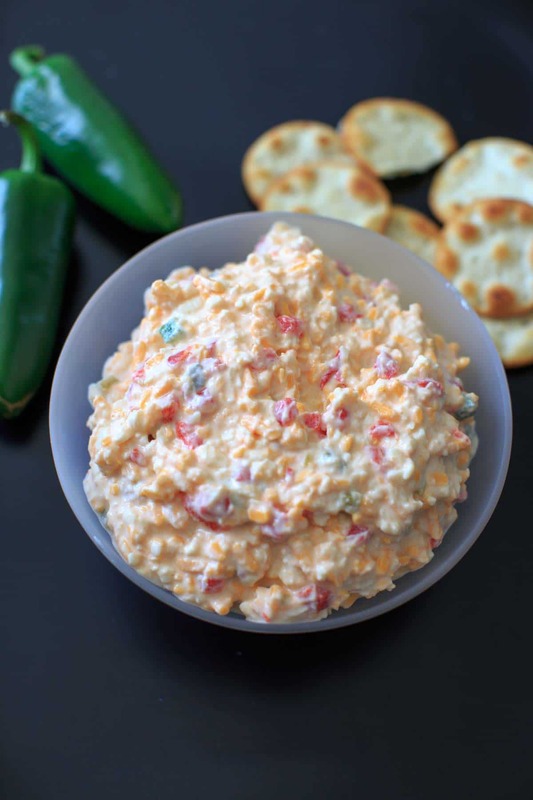 Skinny Jalapeno Pimento Cheese - a spicy, healthier take on the southern favorite. No mayonnaise! Tastes best after chilled in refrigerator for 30 minutes. Serve on sandwiches or as a dip. How did you never have Rainbows, I hope you have made up for lost time! My first thought on the rainbows….how does this even happen??? Lol!! Wow, this looks healthy and inviting. I love the different colors and some really nice textures in there as well. THANK YOU so much for posting a recipe withoit mayonnaise! I despise it so much that its not even allowed in my house. My siblings grew up LOVING “cheese salad” as we call it here in Southern WV. All i could taste was mayo. I recently began making my own lactose free yogurt, and I think your recipe looks perfect to try out. I sure hope I love it as much as they love their mayo goo. Is that 368 calories for the entire bowl or per serving? Per serving – it is still cheese!